Are you searching for April 2020 Orlando flights? Fares are released 11 months before departure, but we can provide advance rates today. Call us for our best price on Virgin, BA, United and Norwegian. Are you stuck with school holiday dates? We feel your pain. Call us now or enquire online and we can help. An early booking is vital. Especially for the weekends of 4th and 11th April 2020. A mid-week departure provides better value. Tuesday and Wednesday departures are the cheapest. Direct flights are expensive during Easter. Indirect flights are much cheaper on peak dates. While good fares are available from Manchester, Glasgow and Edinburgh, the best deals are always from Heathrow. It’s worth considering an alternative arrival airport on peak Easter dates. Tampa (only 90 minutes or so from Orlando) and Miami always offer better value than Orlando International. Book early. Seats are released 11 months before departure. Advance bookers are first in the queue for the best fares. While early April fares are expensive, prices begin to drop very quickly as the month goes on. Heathrow and Manchester have bargains galore from 7th April onwards. From 9th April onwards, even direct flights are cheap. Think you can wait until flights are released and take advantage of this advice? Forget it. We can book flights and fly-drives far cheaper than you, all on a small deposit, and with full ATOL and ABTA protection. Call Alex now on 07944 584 659. Prefer to fly from your local airport? We book connecting flights for a small supplement. Belfast, Edinburgh, Aberdeen, Inverness, Isle of Man, Jersey, Exeter and Newquay all have convenient schedules and connect into both the British Airways and Virgin networks. Bags go straight through. We don’t compromise on quality – we book with reputable airlines such as BA, Virgin, United and Norwegian. How do we achieve good-value fares? Prices fluctuate and we monitor fares daily. We book your seats at the ideal moment; experience allows us to predict when prices have reached rock-bottom. This simple method gives you an excellent price. How much are you expecting to pay for your Easter 2020 Florida flights? High street prices can be over £1200 for peak Easter dates. Follow the advice above and you could secure fares of £650 per adult and £500 per child. Late April fares are much cheaper still – contact us for our best price. We’re already taking bookings for Easter 2020 Florida holidays. So don’t delay, advance book your April 2020 Orlando flights today. Combine with car hire and accommodation for an excellent package rate. All our April 2020 Florida flights and holidays are ATOL and ABTA protected. Book with a deposit of just £100 per person. 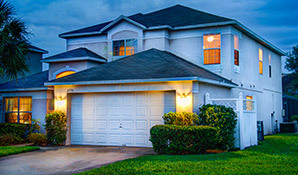 Fly to Orlando and stay for two weeks in a named villa close to Disney. Enjoy some of the best attractions and entertainment on the planet. Explore Florida in a fully-insured car. All from just £895 per person. Need to fly on peak Easter dates and looking for good value? Fly indirect with Virgin and stay for a fortnight in a Westhaven villa. Car hire included. All from just £1075 per person. Located in the popular Champion's Gate area of Davenport, Westhaven is within easy reach of Florida’s major attractions, including Universal and Disney World. It's an ideal location for a family holiday.